On 31 August 1979, Bayern Munich defeated hosts Real Madrid in the opening match of the inaugural Trofeo Santiago Bernabéu. Founded in honor of former Real Madrid manager and President Santiago Bernabéu, who died over one year earlier on 2 June 1978, the Trofeo is a preseason mini-tournament originally contested by Real and three invited teams. In 1978, those teams were Bayern Munich, Ajax, and Milan. Bayern quickly took an 0-2 lead with goals in the 2nd and 16th minutes. Real pulled one back in the 19th minute, but was unable to equalize and the match ended 1-2. Bayern advanced to the Final against Ajax, who had beaten Milan on penalties, and scored two late goals to win 2-0 and claim the first Santiago Bernabéu trophy. 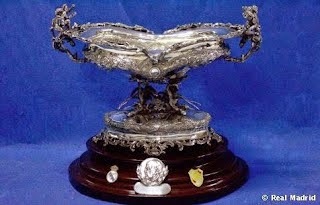 In 1987, the Trofeo abandoned the four-team format and has since been played as a single match between Real and one other team. 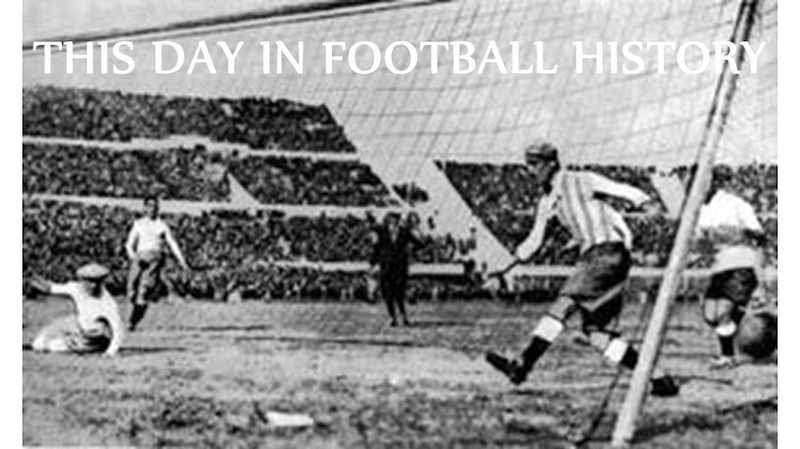 On 30 August 1919, English League football began its first season since 1915, when the League was suspended for World War I. While many clubs fielded teams for regional competitions during that period, all Football League and FA Cup matches were cancelled for the duration of the war. When League play resumed on 30 August 1919, it picked up where it had left off, so that clubs who had been relegated or promoted in 1915 finally appeared in their new surroundings. Both Derby County and Preston North End played their first League matches since achieving promotion at the end of the 1914-15 season by finishing first and second, respectively, in Division Two. 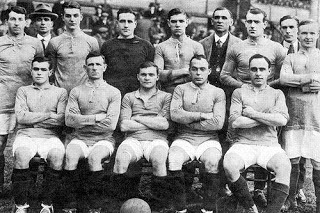 Derby enjoyed their season debut with a 1-1 draw against Manchester United (whose 1919-20 squad is pictured above), while Preston suffered the top flight's most lopsided result of the day, a 4-0 beating at the hands of Blackburn. Tottenham Hotspur, on the other hand, opened its season in the Second Division, relegated after finishing at the bottom of the First Division table in 1915. Their Division Two opener was a stellar 0-5 win away to Coventry City, which was the largest margin of victory that day in the second tier. The start was no fluke, as Spurs went on to win Division Two and earn promotion back to the top flight in 1920. Labels: Coventry City F.C., Derby County F.C., Preston North End F.C., Tottenham Hotspur F.C. On 29 August 1976, former US international midfielder and current Colorado Rapids manager Pablo Mastroeni was born in Mendoza, Argentina. At the age of 4, he moved with his parents to Phoenix, Arizona. Although his father had hoped that Mastroeni would someday play for his native Argentina, young Pablo decided at 9 years old that he wanted to play for the US. He got his wish in 2001, when US manager Bruce Arena called him up for World Cup qualifiers against Honduras and Costa Rica. He earned his first cap on 7 June 2001 in a match against Ecuador and made his first start in the opening match of the 2002 World Cup as the US upset Portugal, 3-2. Mastroeni has made 63 appearances for the United States, but is probably best known for receiving a 45th-minute red card in the 2006 World Cup after roughly tackling Italy's Andrea Pirlo. He has spent his club career in the MLS, first playing for the Miami Fusion (1998-2001), the Colorado Rapids (2002-2013), and the LA Galaxy (2013). In 2014, he took charge of the Rapids as interim manager following the departure of former boss Oscar Pareja. On 28 August 2000, Galatasaray defeated Real Madrid, 1-2, in the UEFA Super Cup before a crowd of 15,000 at Stade Louis II in Monaco. Established in 1972 as the European Super Cup, the competition originally featured the holder of the European Cup against the holder of the European Cup-Winners' Cup and was played over two legs. Starting in 1998, however, the cup was contested in a single match at a neutral venue. The Cup-Winners' Cup was discontinued in 1999, so the 2000 Final was played between the UEFA Champions League holders (Real Madrid) and the UEFA Cup holders (Galatasaray). The Turkish side drew first blood with a penalty kick in the 41st minute, as Real defender Iván Campo was flagged for fouling left back Hakan Ünsal in the box and the Turkish side's new signing, Brazilian forward Mario Jardel, converted the spot kick. Real captain Raúl scored an equalizing penalty in the 79th minute after Galatasaray midfielder Suat Kaya was called for a handball. The match went into extra time, where Jardel decided it by slotting the golden goal past Iker Casillas from eight meters away in the 103rd minute. On 27 August 1994, Hibernian defeated rivals Hearts 0-1 before a crowd of 13,500 at Tynecastle. The win ended Hibs' streak of 22 Edinburgh derbies without a victory--a streak that stretched back for five and a half years. It was only the third match of the season, but Hibs were flying high in second place in the table after a 5-0 win over Dundee United and a goalless draw with Kilmarnock. Hearts, on the other hand, were sitting in eighth position (out of ten), with a 1-3 loss at Aberdeen and a 1-1 draw at Motherwell. The Jambos were nonetheless optimistic, counting on their recent form over Hibs to continue. That optimism lasted until the 62nd minute, when Hibs defender and captain Gordon Hunter sent a 10-yard shot past Hearts keeper Nicky Walker. Hearts were unable to return the favor, as Hibs keeper Jim Leighton proved too resolute in goal and held on for his third consecutive clean sheet. The match was not without controversy, as Hearts midfielder Gary Mackay was sent off in the 74th minute after receiving his second booking and six other players--three from each side--received yellow cards. Hibs didn't have to wait another five and a half years for their next derby win--they defeated Hearts in their very next meeting, a 2-1 win at Easter Road on 29 October 1994. On 26 August 1982, Liverpool unlocked the famous Shankly Gates for the first time. 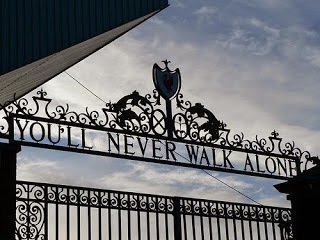 Erected that year as part of ongoing renovations at Anfield, the gates include the Liverpool badge and bear the words "You'll Never Walk Alone" from the hit song by Gerry & the Pacemakers which was adopted by Liverpool supporters as the club's anthem. The club dedicated the new gates to former manager Bill Shankly, who had managed Liverpool from 1959 to 1974. During that period, the team won three First Division titles (1964, 1966, 1973), two FA Cup trophies (1965, 1974) and one UEFA Cup trophy (1973). He's also famous for having said "Some people believe football is a matter of life and death, I am very disappointed with that attitude. I can assure you it is much, much more important than that." Shankly died on 29 September 1981 from complications related to a heart attack. His widow, Nessie, was the one to unlock the gates for the first time. The gates eventually made their way onto the official Liverpool crest that is currently in use. Labels: Bill Shankly, Liverpool F.C. On 25 August 2007, 22-year old Sevilla midfielder Antonio Puerta collapsed on the pitch in the 36th minute of Sevilla's league opener against Getafe. He briefly lost consciousness, but soon recovered and was substituted out the game. He walked back to the dressing room, where he again collapsed and lost consciousness before being rushed to Seville's Virgen de Rocio hospital. Puerta had recently established himself as a rising star for Sevilla, having scored the extra-time match-winner in the club's 1-0 win over Schalke 04 in the UEFA Cup semi-finals. Sevilla supporters refer to that goal as "el gol quenos cambió la vida" (the goal that changed our lives) because it propelled them into a world-record-setting streak of five trophies in 15 months, starting with the 2006 UEFA Cup Final against Middlesbrough, which Sevilla won 4-0, and including the 2006 UEFA Super Cup, the 2007 Copa del Rey, the 2007 Supercopa de Espana, and the 2007 UEFA Cup Final against Espanyol, in which Puerta scored the winning penalty. Puerta died on 28 August, his third day in the hospital. Doctors confirmed the cause as multiple cardiac arrests brought on by arrhythmogenic right ventricular cardiomyopathy, a hereditary heart disease. On 31 August, Sevilla played in the European Super Cup against AC Milan. As a tribute, the players from both sides all wore shirts with Puerta's name on the back. Labels: 2006 UEFA Cup Final, 2007 European Super Cup, 2007 UEFA Cup Final, AC Milan, Antonio Puerta, F.C. Schalke 04, Getafe C.F., R.C.D. Espanyol, Sevilla F.C. 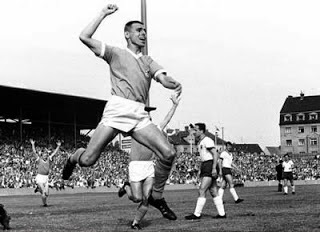 On 24 August 1963, Borussia Dortmund striker Friedhelm "Tino" Konietzka (pictured) scored the Bundesliga's first goal when he found the net in the first minute of Dortmund's season-opening match against Werder Bremen. The 1963-64 season was the first season of the Bundesliga, which had been established the previous summer. Dortmund qualified for the new 16-team league as one of five clubs from the previous regional Oberliga West, while Werder qualified as one of three teams from the Oberliga Nord. In that opening match, Konietzka added a second goal in the 90th minute, but Werder scored three in the interim to claim a 3-2 win. Dortmund were more successful on the season, however, finishing in fourth place while Werder ended up in the 10th position. On 23 August 2005, Swiss side FC Thun beat Malmö 3-0 at Thun's Stadion Lachen. The match was the second leg of the third qualifying round for the 2005-06 UEFA Champions League. Thun had won the first leg in Sweden on 10 August, 0-1, and needed only a draw to advance. Rather than sit back and defend, however, Thun attacked the Swedish side and claimed an early lead with a 25th-minute goal from Brazilian center back Tiago Bernardi (pictured). Forward Mauro Lustrinelli, a Swiss international, added a brace (40', 65') to complete the rout and put Thun into the group stages. Thun's qualification was particularly impressive given the club's small stature. They had only recently been promoted to the Swiss top flight in 2002 and, at the time of their qualification, had an annual budget of only €2 million. They were thus the smallest club ever to qualify for the Champions League. Unfortunately, their success ended in the group stages. Drawn against Arsenal, Ajax, and Sparta Prague, Thun managed one win, one draw, and four losses, to finish third in the group. That finish sent them out of the Champions League, but into the Round of 32 for the 2005-06 UEFA Cup where they lost to Hamburg 1-2 on aggregate. In 2008, Thun were relegated to Switzerland's second tier, the Swiss Challenge League, where they currently compete. On 22 August 1964, the newly-formed BBC2 broadcast the first showing of Match of the Day. The show quickly became a mainstay of British television and popular culture. BBC2 had been launched only four months prior and intended MOTD as a way to train the BBC's cameramen and technicians prior to England's hosting of the 1966 World Cup. The first show featured highlights of only one match--Liverpool's 3-2 defeat of Arsenal at Anfield. It was presented by Kenneth Wolstenholme and Walley Barnes. Because BBC2's broadcasting area was restricted to London at the time, the audience for that show was approximately only 20,000. As BBC2's broadcasting area expanded, the audience quickly grew. In the 1970s, by which time the show had moved to BBC1, MOTD's audience reached 12 million. MOTD is still airing on BBC1, hosted by former England captain Gary Lineker. 21 August 1936 - J.A.H., R.I.P. On 21 August 1936, football reporter and author J.A.H. Catton died at the age of 76. He was widely regarded as the greatest sports writer of his day and is considered the father of modern football journalism. He got his start as a reporter in 1875 when he went to work for thePreston Herald and began covering local side Preston North End. In 1886, he began writing for The Athletic News, a weekly sports journal based in Manchester. He wrote under a pseudonym, first using "Ubique," and then "Tityrus." He later became the editor and helped drive circulation up to 50,000 by 1891, then to 100,000 by 1893 and 170,000 by 1919. 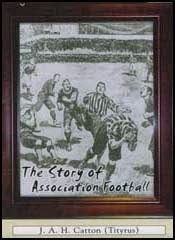 In 1926, Catton published a book, The Story of Association Football, which further helped publicize the increasingly-popular sport. By the time of his death in 1936, newspapers in Britain devoted substantial coverage to football, due in significant part to his efforts. Labels: J.A.H. Catton, Preston North End F.C. On 20 August 1916, the United States played their first official international match, defeating Sweden 2-3 in Stockholm. The United States had earlier played a couple of unofficial matches against Canada, first losing 0-1 in 1885, then winning 1-0 in 1886, both in Newark, New Jersey. 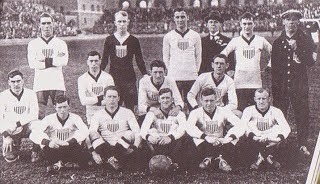 The match against Sweden, however, was the first since the founding of the United States Soccer Federation in 1913. Approximately 21,000 people watched the match, including Sweden's King Gustav V. US captain Thomas Swords scored the opening goal in the first half, with Charles Ellis adding another in the second half to put the Americans up 2-0. Sweden then pulled one back, but Harry Cooper netted a third for the US. Five minutes from time, Sweden added a second to end the match 2-3 in favor of the visiting American side. 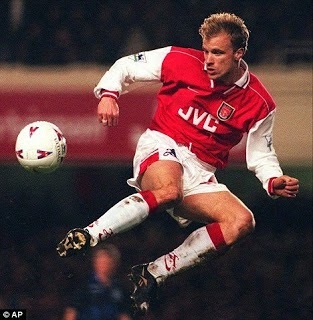 On 19 August 1995, striker Dennis Bergkamp debuted for Arsenal in a 1-1 home draw against Middlesbrough. Arsenal manager Bruce Rioch lured the Dutch international away from Inter, who had signed him from Ajax in 1993 for a transfer fee of £12 million, making him the second-most expensive footballer in the world at that time. His two seasons in Italy were unsuccessful, however, and Arsenal was able to purchase him for the relative bargain of £7.5 million. A three-time Eredivisie top scorer during his time with Ajax, Bergkamp did not score for the Gunners until his seventh match, a 4-2 home win over Southampton on 23 September 1995. He quickly resumed his former proficiency in front of the goal, however, and notched 120 goals in 411 appearances for Arsenal before retiring after the 2005-06 season. He earned a number of personal honors while playing for the North London side, including the English PFA Player of the Year award in 1998, a third-place finish in FIFA Player of the Year voting (1997), and two Premier League Goal of the Season awards (1998, 2002). On 18 August 1979, Reading FC drew 2-2 with Brentford FC, thus ending Reading's 1,103-minute streak without conceding a goal. The match was the season-opener for both teams, and the first in Division Three for the newly-promoted Reading. Reading's keeper throughout the streak, which consisted of 11 consecutive clean sheets, was Englishman Steve Death, who made 471 appearances for the Royals from 1969 to 1982. The streak began on 28 March 1979, with Reading's 4-0 win over Grimsby Town. At the time, the Royals were playing in Division Four. The win moved them into first place in the table, which is where they finished after following up the win over Grimsby with a season-ending run of 7 more wins and 3 draws, earning promotion to Division Three. The streak was an English league record until 31 January 2009, when it was broken by Manchester United's Edwin Van Der Sar. On 17 August 2006, Italian football's governing body, the Federazione Italiana Giuoco Calcio ("FICG"), penalized Reggina Calcio SpA with a 15-point deduction for the club's involvement in the Italian football scandal nicknamed "Calciopoli." The scandal involved a number of Italy's biggest clubs, including Juventus, Milan, Fiorentina, and Lazio. Reggina was founded in 1914 as Unione Sportiva Reggio Calabria in the southern Italian city of Reggio Calabria on the Straits of Messina, just across from the island of Sicily. It underwent several name changes over the years, settling on Reggina in 1986. It has spent recent years bouncing back and forth between Italy's top two divisions, Serie A and Serie B. During the investigation in 2006, the club were in Serie A, having earned promotion in 2003. The FICG found Reggina guilty of match-fixing during the 2004-2005 season, in which Reggina finished in 13th place out of 20 Serie A teams. The prosecutor asked for Reggina to be demoted to Serie B, but the FICG instead applied a 15-point deduction for the following season. The deduction was reduced on appeal to 11 points, but additional penalties remained, including a club fine of £68,000 and a fine of £20,000 on club President Pasquale Foti, who also received a 2.5 year ban from football. Despite the points deduction, Reggina finished the 2006-07 season in 14th position with 40 points, just one point above the relegation zone. They were relegated two years later, however, and are currently back in Serie B for the 2009-2010 season. Labels: Calciopoli, Federazione Italiana Giuoco Calcio, Pasquale Foti, Reggina Calcio SpA. 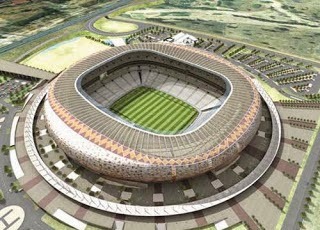 On 16 August 1997, South Africa beat Congo 1-0 at Soccer City (pictured) in Johannesburg. With the win, South Africa qualified for its first World Cup Finals ever. It was also the first time that any team from the southern part of Africa qualified for the Finals. The victory was significant for the young Bafana Bafana, whose racially-unified team had been established only five years prior and were now pushing for the top of African football as one of only five sides qualifying from the CAF. Their trip to the World Cup was short-lived, however, as a loss (to France, 3-0) and two draws (with Denmark, 1-1, and Saudi Arabia, 2-2) placed them third in their group and prevented them from advancing to the knockout rounds. 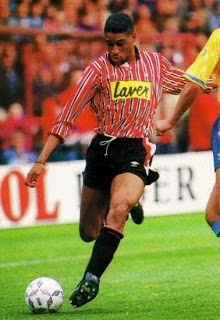 On 15 August 1992, the first ever Premier League goal was scored by Sheffield United striker Brian Deane, who netted in the 5th minute of the Blades' opening day match against Manchester United. He also scored with a penalty kick in the 50th minute, propelling the Blades to a 2-1 win. Manchester United recovered from their poor start, however, claiming the inaugural Premier League title. Sheffield United finished in 14th position. Labels: Brian Deane, Manchester United F.C., Sheffield United F.C. On 14 August 2003, UEFA ratified the merger of Total Network Solutions FC with neighboring Oswestry Town FC, a combination notable for the fact that the two teams were separated by the border between England and Wales. Total Network Solutions FC was formed in 1959 as Llansantffraid FC in the Welsh border village of Llansantffraid-ym-Mechain. They played in the lower Welsh leagues until 1993, when they earned promotion to the League of Wales. 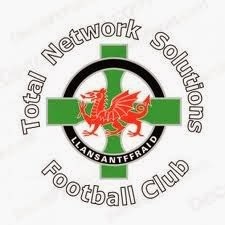 In 1996, Total Network Solutions, a computer company located in the nearby English town of Oswestry, negotiated a sponsorship by which the club was renamed to "Total Network Solutions Llansantffraid FC." The original name was dropped completely in 1997, so that the club became Total Network Solutions FC, the first time a club in the UK was named solely after its sponsor. In 2003, the club merged with Oswestry Town, who, despite being located in England, also played in the League of Wales. UEFA initially opposed the merger for combining clubs from different countries, but eventually consented. The merged club retained the Total Network Solutions name and colors, but used Oswestry's colors for its away kit. In 2006, the club's sponsor was bought out by British Telecom, who ended the sponsorship. The club then changed its name to the New Saints of Oswestry Town & Llansantffraid F.C., or "The New Saints" for short. Labels: League of Wales, Llansantffraid F.C., Oswestry Town F.C., The New Saints of Oswestry Town and Llansantffraid F.C., Total Network Solutions F.C. On 13 August 2003, Manchester United introduced its new signings, Portuguese winger Cristiano Ronaldo and Brazilian midfielder Kléberson. United acquired Ronaldo from Sporting C.P., whom he had joined on a youth contract in 1997 at the age of 12. He joined Sporting's senior team in 2001 at the age of 16 and made 31 appearances for them, scoring five goals. United manager Alex Ferguson said that he had been tracking Ronaldo for at least nine months, but had been particularly impressed with Ronaldo's play in Sporting's 3-1 defeat of United in a friendly held in Lisbon the week before his signing. The winger had also drawn the attention of Real Madrid, Juventus, and Chelsea, sparking a bidding war that drove the transfer fee up to £12.24 million, making Ronaldo the most expensive teenage signing in Britain to that point. As if the record signing fee didn't create enough pressure on Ronaldo, Ferguson added to it by giving him United's famous No. 7 shirt, previously worn by United legends such as George Best, Bryan Robson, Eric Cantona, and - most recently - David Beckham. Ronaldo rose to the challenge, however, and helped lead United to three consecutive Premier League titles (2007, 2008, 2009), one FA Cup trophy (2004), and one UEFA Champions League trophy (2008). He also claimed a number of individual honors, including the FIFA World Player of the Year in 2008. In July 2009, Ronaldo moved to Real Madrid for a transfer fee of £80 million. Kleberson, who was signed from Brazilian side Atlético Paranaense for £6.5 million, was less successful, making only 30 appearances for United before transferring to Turkish side Beşiktaş for £2.5 million. Labels: Alex Ferguson, Atlético Paranaense, Beşiktaş J.K., Cristiano Ronaldo, Kléberson, Manchester United F.C., Real Madrid C.F., Sporting C.P. 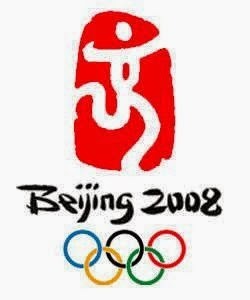 On 12 August 2008, Brazilian forward Cristiane and US forward Heather O'Reilly both turned in record-setting performances in the 2008 Summer Olympics in Beijing. It was the last day of the group stages in the women's football competition. Brazil faced Nigeria and went down 0-1 to a 19th-minute penalty strike before Cristiane turned the match around. She scored the equalizer in 34th minute, then added a second in the 35th minute and a third in the third minute of first-half injury time (45'+3) to complete the fastest hat-trick in the history of women's Olympic football. The final score of 3-1 sent Brazil to the top of their qualifying group and into the knockout rounds. Later that day, the US were playing New Zealand when O'Reilly scored 41 seconds into the match - the fastest goal in the history of women's Olympic football. The US won 4-0 to finish at the top of their qualifying group. Brazil and the United States met in the Final, where the US side claimed a 1-0 win. 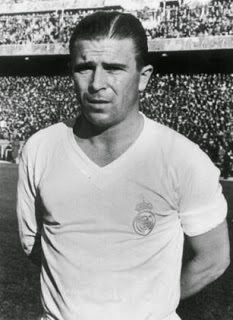 On 11 August 1958, 31-year-old Hungarian forward Ferenc Puskás signed for Real Madrid. At the time, he was one of the most famous footballers in the world, with a lengthy list of honors, including being the top goal scorer in Europe in 1948 and the World Player of the Year in 1953. Nicknamed "the Galloping Major," Puskás had led his previous club, Honvéd, to five Hungarian League titles and had been instrumental in Hungary's gold medal performance in the 1952 Summer Olympics. In 1956, he was in Europe with Honvéd for the European Cup when the Hungarian Revolution began in Budapest. Several Honvéd players, including Puskás, decided not to return to Hungary. Because of his refusal to return, UEFA banned him from playing for two years. He signed with Real Madrid when his ban expired. He enjoyed continued success at Real, winning five consecutive La Liga titles from 1961 to 1965 and making five appearances in the European Cup Finals and winning three of them. The last was in 1966, after which Puskás retired from playing. Puskás subsequently managed several different clubs from 1967 to 1992, including Panathinaikos, whom he guided to the European Cup Final in 1971. He passed away in November 2006 at the age of 79 and is buried under the dome of St. Stephen's Basilica in Budapest. Labels: Ferenc Puskás, Honvéd F.C., Hungary, Panathinaikos FC, Real Madrid C.F. 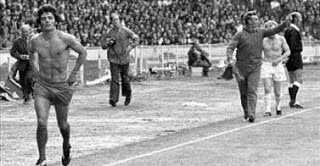 On 10 August 1974, Liverpool defeated Leeds United on penalties, 1-1 (6-5), to claim the FA Charity Shield before a crowd of 67,000 at London's Wembley Stadium. It was the first Charity Shield match to be shown live on television and it was one that most spectators would not forget. The day was significant for both managers, as it was Bill Shankly's last match in charge of Liverpool and Brian Clough's first in charge of Leeds United. Prior to his appointment at Elland Road, Clough had been fiercely critical of Leeds and his predecessor Don Revie for playing what Clough called "dirty football." Unfortunately for Clough, the match was overshadowed by the very tactics he had criticized. Early in the match, Leeds midfielder Johhny Giles earned a quick booking for lashing out at a Liverpool player. The situation grew worse as Leeds midfielder and captain Billy Bremner repeatedly knocked into Liverpool forward Kevin Keegan. Keegan grew increasingly frustrated, both with Bremner and with the referee for allowing Bremner's behavior to continue. The situation escalated to the point where a scuffle broke out between Keegan and Bremner and both were ejected. On their way off the pitch, both players insulted their teams and supporters by stripping off their shirts and throwing them to the ground. Although both players were ejected, Clough was certain his own player was to blame and was quoted afterward as saying "Billy Bremner's behaviour was scandalous, producing one of the most notorious incidents in Wembley history. It was as if the players were offering grounds for all my criticism that they had resented so much." The FA fined Keegan and Bremner £500 each. Keegan was also suspended for three matches, while Bremner was suspended for eight. By the time Bremner's suspension ended, Clough had departed from Elland Road, having been sacked after 44 days in charge. Labels: 1974 F.A. Charity Shield, Bill Shankly, Billy Bremner, Brian Clough, Johnny Giles, Kevin Keegan, Leeds United AFC, Liverpool F.C. 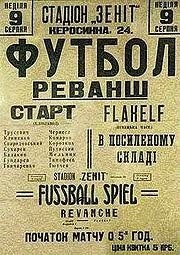 On 9 August 1941, a team of Soviet prisoners of war defeated a Nazi Luftwaffe side 5-3 at the Zenith Stadium in Kiev. The Soviet team was formed by a group of prisoners who worked at a bakery in occupied Kiev. Nikolai Trusevich, who had been a goalkeeper for Dynamo Kiev before the war, was given a job there sweeping floors by the bakery's manager, Iosif Kordik, who was a Dynamo Kiev supporter. Together, they managed to put together a team of eight former Dynamo Kiev players and three former players from Lokomotiv Kiev. The team, named FC Start, played their first match on 7 June 1942, defeating another local side 7-2. Two weeks later, despite being malnourished and poorly equipped, Start defeated a team of occupying Hungarian soldiers by the score of 6-2. Over the next few weeks, Start continued a string of remarkable victories over occupying military teams, including an 11-0 win over a Romanian garrison and a 6-0 win over a German side. According to legend, Start's incredible success drew the attention of Luftwaffe chief Hermann Goering, who sent a crack Luftwaffe side to Kiev. That team, called Flakelf, included several German national team members. Start met them on 6 August 1941 and beat them 5-1. Embarrassed by the defeat and eager to claim revenge, Flakelf demanded a rematch to be held on 9 August. The rematch was held at Kiev's Zenith Stadium. The referee was a member of the Gestapo who entered the Start locker room prior to the match and told the prisoners "Win and die, lose and survive." Despite the warning, the Ukrainian players won 5-3 and were taken from the field and summarily executed. In reality, however, the referee was not a Gestapo member and did not issue the famous warning. Nor was Flakelf a crack Luftwaffe squad sent by Goering, but was instead another local German garrison. The match was played fairly and the Ukrainian side were not taken off the field and shot, though several Start players were killed by the Nazis later in the war, along with several other Soviet prisoners. The rumor of the "Match of Death" persists, however, and was the basis for the film "Escape to Victory" (marketed as "Victory" in the US) starring Sylvester Stallone, Michael Caine, and Pelé. 8 August 2003 - The Lesson Is "Don't Mess With Murdoch"
On 8 August 2003, Rupert Murdoch's British Sky Broadcasting ("BSkyB") paid a then-record £1.02 billion to secure the live broadcast rights for the English Premier League. BSkyB acquired its first monopoly over live Premier League coverage when the league was formed in 1992. Mudoch's company outbid all other interested parties that year and did so again when the rights came up for renewal in 1996. For the 2003 auction, the European Commission had expressed antitrust concerns about BSkyB's monopoly and demanded that the broadcast rights for the league be divided up into four separate packages, with the expectation that competing broadcasters would acquire different packages. BSkyB had other intentions, however, and snapped up all four packages in the record £1.02 billion purchase. Irish broadcaster Setanta eventually broke BSkyB's monopoly in 2007 when it paid £392 million to acquire two of the six packages up for auction. BSkyB acquired the other four for £1.3 billion. In the summer of 2009, however, Setanta was unable to make an installment payment and lost its British broadcasting rights, which were then acquired by US-based broadcaster ESPN. On 7 August 2004, Japan defeated China 3-1 in the Asian Cup Final before a crowd of 62,000 at Workers Stadium in Beijing, sparking a riot among Chinese supporters. The tournament was shrouded in anti-Japanese sentiment, as many Chinese attendees, still angry over Japan's treatment of China during World War II, harrassed the Japanese side, booing anytime they took possession of the ball, displaying political banners denouncing Japan, and drowning out the Japanese national anthem. Prior to the Final, authorities from both nations expressed concerns about the growing tension. Chinese officials increased the police presence for the match, while the Japanese embassy in Beijing cautioned fans of its national team to avoid drawing attention to themselves. According to the BBC, "tens of thousands" of Chinese supporters were in the stands for the match to watch China's first Asian Cup Final in 20 years. The match itself was free from violence. The teams were level 1-1 at the half, but Japan went ahead in the 66th minute with a controversial goal from defender Koji Nakata. Replays showed that Nakata's scoring strike went in off of his hand, but the goal was allowed. In any event, Japanese striker Keiji Tamada added an insurance goal in the 91st minute to seal the win. 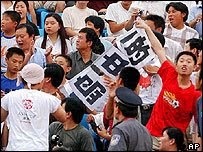 After the match, the Japanese supporters were driven to safety while Chinese fans started to riot. They burned Japanese flags and sang political songs. Several fights broke out and many bystanders were injured, including a couple of photographers who were beaten by the police. On 6 August 1875, a group of Irish-born football enthusiasts in Edinburgh's Cowgate neighborhood created Hibernians, named after the Roman word for Ireland. The club went on to play a significant role in the progress of Scottish football. From the moment of its creation, the club had strong religious ties. Their first manager (and one of the founding members) was a priest, Canon Edward Hannon. Also, all players were required to be members of the Catholic Young Men's Society, an early sign of sectarianism in Scottish football that later came to a head in the Old Firm rivalry between Celtic and Rangers. In fact, when Celtic was formed in 1887, many of the first players were borrowed from Hibernians. For reasons that have never been explained, Hibernians failed to attend the meeting at which the Scottish Football League was formed, and thus were not included in the nascent league. That failure made it difficult for the club to schedule matches and ultimately led to its near-demise in 1891, when it ceased operations. It reformed in 1892, however, as Hibernian F.C. The newly-named club joined the SFL Second Division in 1893 and was promoted to the First Division for the 1895-96 season. 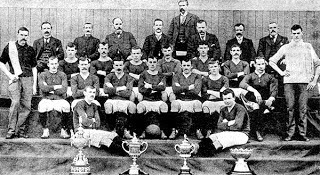 The early 1900s were successful for Hibs, who won the Scottish Cup in 1902 and the league title in 1903, but began to decline in the 1920s as the Old Firm began to rise. Hibs enjoyed a renaissance in the 1950s, when they were managed by Scottish coaching legend Jock Stein. They won the league in 1952 and finished second in 1950 and 1953 (both times to Rangers). In 1955, they became the first British team to play in the European Cup, making it to the semifinals of the inaugural tournament in 1955-56 before losing to Stade de Reims 3-0. Stein left after that season to manage Celtic, whom he transformed into a dominant side. 4 August 1999 - But Would They Have Beaten France? Probably, Yeah. On 4 August 1999, host nation Mexico beat Brazil 4-3 in the Confederations Cup Final before a crowd of 110,000 at Mexico City's Estadio Azteca. The tournament was the fourth Confederations Cup, which typically includes the winners of the six FIFA confederations (CAF, CONMEBOL, UEFA, AFC, OFC, and CONCACAF) as well as the World Cup holders and the host country. For the 1999 tournament, World Cup holders France declined to participate, so World Cup runners-up Brazil filled that slot. Brazil were also CONMEBOL champions, however, so CONMEBOL runners-up Bolivia took that confederation's qualifying spot. Similarly, because CONCACAF champions Mexico qualified as hosts, the United States filled the CONCACAF slot as the second-place team. They were joined by Egypt (CAF champions), Germany (UEFA champions), New Zealand (OFC champions), and Saudi Arabia (AFC champions). The Final featured a showdown between the tournament's two best players—Brazilian midfielder Ronaldinho and Mexican midfielder Cuauhtémoc Blanco. Ronaldinho had scored in every match for Brazil, including a 13th-minute gamewinner in their 1-0 win over the United States in the group stage and a hat-trick in their 8-2 demolition of Saudi Arabia in the semi-finals. 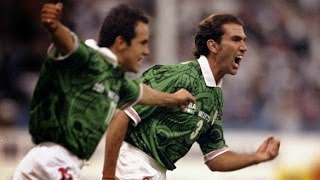 Similarly, Blanco netted four in Mexico's opening match against Saudi Arabia and scored the 97th-minute golden goal in Mexico's 1-0 win over the United States in the semi-finals. In the Final, Mexico took a 2-0 lead in the first half with goals from midfielder Miguel Zepeda (13') and striker José Manuel Abundis (28'). Brazil pulled one back just before the break when left winger Serginho converted a 43rd-minute penalty kick. Striker Roni then equalized in the 47th minute, but the game did not remain level for long, as Zepeda scored his second in the 51st minute. Blanco added another eleven minutes later, to recapture Mexico's 2-goal lead. It turned out to be the matchwinner, as Brazilian midfielder Zé Roberto completed the scoring with a goal in the 63rd minute. Blanco and Ronaldinho tied with Saudi Arabia's Marzouq Al-Otaibi for most goals of the tournament at 6 each. And while Blanco helped his team to the title, Ronaldinho earned the Golden Ball as the tournament's best player.